Timely Tax-Filing Topics: Divorce, 1099 Forms, Brokerage Accounts, Living Trusts, Elder Abuse | Law Offices of Connie Yi, P.C. As we head into the heart of the tax-filing season, we have received many questions about a wide variety of related topics. 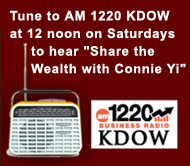 Because we are so focused on taking care of clients during the work-week, we usually try to answer a couple of these questions during our weekly KDOW 1220 AM radio program, Wealth Preservation and You. Q.: Why did I receive a 1099 form from my brokerage firm for 2011, when I had never received one of these for previous years? A.: Two basic types of brokerage firms exist: full-service and “warehouse.” Like the big-box retail warehouse stores, a warehouse brokerage firm offers lower rates in exchange for a do-it-yourself type service. Traditionally, a full-service firm would file a Form 1099 with the IRS on your behalf, so you did not have to take the time and effort to determine that year’s cost basis yourself. In an attempt to account for all possible sources of taxable revenue, the IRS implemented a new regulation for 2011 that requires all brokerage firms to submit 1099s to the government for all accounts. Because many warehouse brokerage firms did not already have a system in place to mass distribute these 1099s, you can probably expect that some of these might arrive in the mail later than anticipated. If you inherited any stocks or other financial securities during the 2011 tax year, you may have to deal with some 1099 issues. 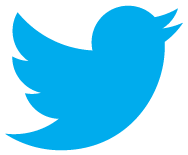 Q.: I received a Form CP-2000 from the IRS about some stocks I sold a few years ago. Why did I receive this now and what do I need to do? A.: Taxpayers are required to report all income to the IRS, including stock sale transactions, as part of itemizing your capital gains and losses. You received a CP-2000 because the IRS received additional information about your income, from one of your employers, banks, brokerage firms, or other payers, which does not match their records. If you received a CP-2000, we recommend you visit the IRS website and carefully read the CP 2000 Frequently Asked Questions (FAQs) and act accordingly by the indicated deadline. In some circumstances, in which proper IRS procedures may not have occurred within the required amount of time, you may be eligible to have the interest reduced or removed on the back taxes you owe. Q.: I am a certified financial planner and I suspect one of my clients has not reported a substantial foreign bank account to the IRS. Do I need to do anything about my suspicions or is it not my problem, because I do not prepare this person’s taxes? A.: As an ethical professional, you do not want to be in a position that will compromise your integrity or hurt your reputation. Because you do not prepare and sign this client’s tax return, your exposure and liability is not as great as an accountant who does sign a client’s tax form. Obviously, knowingly signing a false tax return is illegal, whether it is your own or someone else’s. I recommend, if you do find your self in a compromising and potentially illegal position regarding any unreported income or assets – in the U.S or abroad – that you quickly withdraw from the case and tell your client to seek counsel from a legal adviser. Q.: My parents recently retired and now they frequently receive invitations to attend seminars about setting up a living trust. Is a living trust a good financial instrument for retirees? 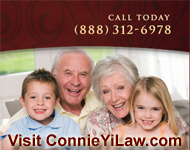 A.: We have frequently spoken and written about estate planning and living trusts. Without fully knowing your parent’s financial situation, I cannot say whether or not a living trust is appropriate for them. However, elder abuse is a real problem, so we can recommend that you try to ensure your parents do not fall prey to they many types of scams that target vulnerable senior citizens. In some cases, grown children who need money take advantage of elderly parents by dipping into their savings. A fine line can exist between a parent knowingly helping a child and a child helping themselves to a parent’s nest egg. A common form of coordinated and intentional elder abuse is a “trust mill” that sells living trust packages for $399, which is one dollar below the amount at which this ruse becomes a felony. Many times these packages are presented at seminars that offer free lunch as an incentive. After the seminar, where personal information was gathered about the attendees. a sales representative will call on attendees in their homes to con them into buying a trust package. The problem with the package is that it does not include any instructions or means to fund the trust or move money into and out of it, so it ends up being a worthless entity. Other scams include a medical qualification program, where a salesperson actually tries to sell annuities to the susceptible senior, and a home improvement program, where non-licensed contractors convince seniors to use a home equity line of credit to finance work up-front that never gets done. Q.: I am researching setting up a trust as a part of my estate plan. Who should I consider as the trustee? A.: The main trait that we believe a trustee needs is a propensity for paperwork, especially if there are multiple beneficiaries. Because of the fiduciary responsibility a trustee has to all of the beneficiaries, quite a bit of communication will be involved when financial decisions are made for the trust, such as selling property or making investments. Written notifications should be delivered by the trustee to all beneficiaries when major decisions are made, as a means of avoiding confusion and conflict, as well as the appearance of self-dealing. If you have any timely questions that we can answer for you on our next broadcast, please submit them by using the form on the Contact Us page on our website. This entry was posted in Estate Planning, Filing Your Tax Return, Income Tax, Offshore Bank Account, Radio Show: Wealth Preservation and You, Tax Law, Tax Return Preparation, Trust Administration and tagged $399, 1099 Forms, Brokerage Accounts, capital gains, cost basis, CP-2000, Divorce, Elder Abuse, estate plan trustee, Estate Planning, fiduciary responsibility, financial planner, foreign bank account, Form 1099, home equity line of credit, home improvement program, IRS, KDOW, living trusts, medical qualification program, multiple beneficiaries, non-licensed contractors, self dealing, tax filing, trust mill, trust package, Wealth Preservation and You. Bookmark the permalink.